This is Part 1 of a two-part series on the filming locations of Water For Elephants. Filmed in Tennessee (Chattanooga), Georgia (Chickamauga), and California (Los Angeles, Fillmore and Piru), Water For Elephants is a magical treat for the eyes. Everything about the film is beautiful, from the breathtaking cinematography to the film’s “biggest” and most memorable star Tai, who played Rosie, the elephant. Directed by Francis Lawrence (I Am Legend), the movie has an impressive cast, Oscar winner Christopher Waltz (Inglourious Basterds), Oscar winner Reese Witherspoon (Walk The Line), Hal Holbrook (The Event, ER, The Sopranos), and international heart-throb Robert Pattinson (Twilight, Eclipse, New Moon). The story of Water For Elephants takes place during the early part of the Great Depression. The central character is a young man named Jacob Jankowski (Pattinson) who - by fate - hops onto a train that is home to the “Benzini Brothers Most Spectacular Show on Earth.” A veterinary student from ivy league Cornell, Jacob is charged of taking care of the circus menagerie. There he meets Marlena (Witherspoon), the beautiful equestrian star who’s also married to August (Waltz), the charismatic but violent-tempered circus master. They together in turn meet Rosie, a beautiful Asian elephant, who becomes the only hope of the circus for a sold-out show. Jacob, Marlena and Rosie become a team bonded by love and trust. Soon enough, they realize that staying together is their only hope for survival. About two-thirds of the filming of Water for Elephants took place in Ventura County, near the towns of Fillmore and Piru. The production spent approximately 50 days shooting along the 30 miles of railroad track between Santa Paula and Piru. The trains used in the film belong to the Fillmore & Western Railway Co., located in historic downtown Fillmore. The production set up circus camps in two locations, one west of Fillmore and the other close to Piru. Image of Fillmore Western Railway Trains via Wikipedia. In Water for Elephants, the Benzini Bros. train travels through the northeastern of the United States. Since the trains used in the movie were located in Southern California, filmmakers had to use CGI (computer-generated imagery) to transform arid mountains into lush green hills with the appropriate skyline in the background. Director Francis Lawrence said that the Fillmore/Piru train set was a better choice as a filming location than trains in other regions, including the Northeast where the story is supposed to take place. Photo of the train set on Water For Elephants via Google. Image of the circus set of Water For Elephants via Flickr. Fillmore & Western Railway trains are no strangers to Hollywood. The train company’s nickname is “Home of the Movie Trains.” Its 50 freight and passenger trains and 10 locomotives have starred in more than 400 commercials, films, and television shows (Bones, Chuck, ER, Criminal Minds, Mad Men, Medium, Fear Factor, The Event, and Monk - to name just a few). 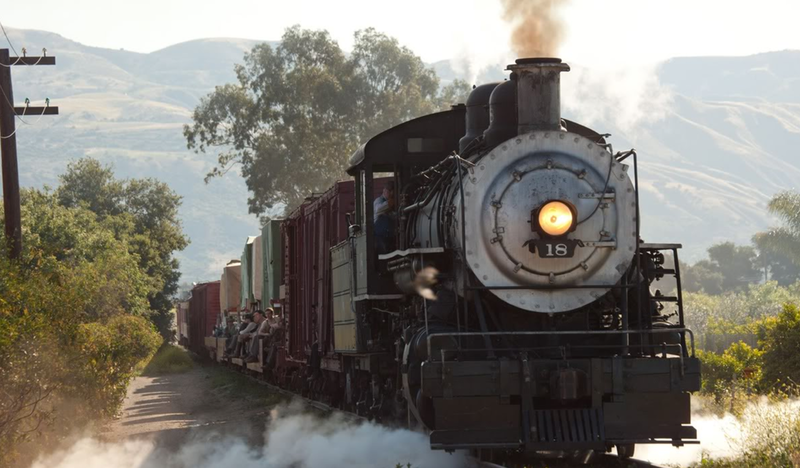 Movies filmed along the railway include Seabiscuit, Race to Witch Mountain, Inception (the dream sequence of a train suicide scene), Atlas Shrugged, and of course Water For Elephants. Kathleen McCreary, director of sales and marketing for the Fillmore & Western Railway, said that the Water for Elephants production contacted the railroad in winter 2009 when they were scouting for film locations. “They needed vintage train cars and boxcars from the 1930s, and we fit that bill,” said McCreary. To complete the picture, the production also brought in on a flat bed truck a steam locomotive from Carson City, Nevada — the Virginia & Truckee Railroad Co.‘s Engine No. 18. “We had that one shipped in, but all the other cars — stock cars, passenger cars, the stateroom car — all that stuff we got from (the Fillmore & Western Railway) and refurbished them the way we needed to,” shared director Lawrence. Soon after that, as if by magic, train wagons with the words “Benzini Bros. Most Spectacular Show on Earth” appeared in downtown Fillmore. Image of the Benzini Bros. train set from Water For Elephants via Flickr. The company’s regular weekend excursion trains to Santa Paula passed by the Fillmore set every Saturday and Sunday. Those train rides provide riders a once-in-a-lifetime treat, to see the atmospheric sets of Water for Elephants in a way that no one else (without a super zoom lens) could have access to. Here are more Benzini Bros. Train photos on the set of Water For Elephants. Even though it was a major film location for Water for Elephants, Fillmore itself is a rare small town with wide open landscape in suburban Southern California. It has been accommodating the railroad and orange industries since the beginning of its history (the late 1800’s). Located in Ventura County and the Santa Clara River Valley, Fillmore’s population as of 2010 was around 15,800. The entire city occupies about 2.8 square miles of land and is predominantly driven by the agricultural industry. And yes, it is still rural and doesn’t have a movie theater. It does, however, have a Starbucks! Image of Filmore, California via Google. Even though the production set up camp near downtown Fillmore, there was no filming taking place in the city itself. The production was self-contained and well-equipped, so they didn’t need much else outside of the set. “All I do is live and breathe on the set,” said Lawrence. “I’d pull into base camp, went over the little berm into our ‘30s circus, and 12 hours later I would come out and drive home.” He stayed at a hotel in Valencia during filming, but rarely spent time there except to sleep and rest. Fillmore’s Western scenery makes it popular with Hollywood. As a result, it’s the filming location for many productions, including CSI, Big Love, and Jericho. The main big-top tent in the movie was set up near Piru, a small town with a population of under 2,000. Piru is located in Eastern Ventura County in the Santa Clara River Valley, near State Route 126, seven miles east of Fillmore. The big-top tent went up two weeks before rehearsals and training to give the white canvas enough time to “age” for a more authentic look. Image of the big-top tent set of Water For Elephants in Piru, California - via Google. Production still from Water For Elephants via Google. Piru is no stranger to Hollywood. It’s the filming location for many TV productions and films over the years, including Desert Fury (1947), A Star Is Born (1954), The California Kid (1974), Dukes of Hazzard, Murder She Wrote, and Twilight Zone: The Movie (1983). More recently, it stood in as the fictional town of Bon Temps, Louisiana, in the popular HBO series True Blood, and in Disney’sRace to Witch Mountain (2009), it became the small town called Stoney Creek. Even though many of the train scenes were filmed on location in Fillmore and Piru, a few of the train’s interior shoots were filmed on a sound stage at Fox Studios. The spectacular Benzini Bros. Circus Parade sequence where Marlena (Reese Witherspoon) rode Rosie into town was also filmed at Fox Studios, on its beautiful, versatile “New York Street” set. During the final four days of filming, the production was in Tennessee and Georgia to film Jacob (Robert Pattinson) at his family home. A lone farm house in the middle of open fields in Chickamauga, Georgia, was used as the Jankowski house. As remote as that location was, there were still hundreds of fans lining up on the road “hoping to catch a moment in movie history” … glimpses of Pattinson filming his scenes at Jacob’s house. The Jankowski house in real life belongs to the Cross family. It has no electricity and no water, and no one has lived in the house in the past 12 years. Carol Cross said in an interview that in the spring of 2010, “a man just approached [her husband] and asked him who owned the house and wanted to know if it would be ok if they considered shooting a movie there.” According to the Cross family, the production crew had spent months to cover many miles on the interstate to find the perfect 1930’s location for the movie. They finally spotted her house and the rest is movie-making history. After securing the house for filming, film crews have made the trek back and forth to Chickamauga, Georgia, to scout and prepare the location for filming. Located on West Cove Road, the house was renovated by the production’s art department. When cosmetic changes to the house’s interior and exterior were finished, it was magically transformed into an authentic 1930’s home, with antique cars and dated laundry hanging from clothes pins in the yard. Cross’s farm house was ready for its once-in-a-lifetime job. Chickamauga itself was bursting at the seams with excitement of having a motion picture filmed in their own backyard. Hollywood glamour and a chance to rub elbows with Robert Pattinson aside, any time a major movie comes to town, it brings along a boost to the local economy. — Bebe Heiskell, Walker County Commissioner - on having Water For Elephants filmed in Chickamauga, Georgia. For more information on filming in Georgia, visit the Georgia Film, Video and Music Office’s website. After Chickamauga, Water For Elephants spent two weeks filming in Chattanooga, creating a huge $1 million impact on Chattanooga’s economy. “When a film comes in town, they leverage a lot of economic impact. The bigger the film the better! And there’s a multiplier affect of about two and a half dollars leveraged in the community for every dollar they spend in production,” said Missy Crutchfield, who works at the City of Chattanooga Arts Education and Culture Department. Production still of Water For Elephants via Google. How does having a movie filmed in town help its economy? With Water For Elephants filming in Chattanooga, the production hired local carpenters, painters, and greensmen to develop film sets and prepare them for filming. Speaking of historic trains, the Tennessee Valley Railroad Museum (TVRM) provided a vintage train and a 3-mile railroad track for the film set. “The Tennessee Valley Railroad Museum is what makes Chattanooga unique for filming,” said TVRM Marketing Coordinator Steve Freer, who has been campaigning tirelessly for almost two years to bring Water For Elephants to Chattanooga. — Bob Raines, Tennessee Film, Entertainment & Music Commission - on having Water For Elephants filmed in the state. Water For Elephant was his first shoot in Chattanooga, and Lawrence liked the enthusiasm of the people here. — Francis Lawrence, director of Water For Elephants - on filming in Chattanooga, Tennessee. One last interesting tidbits before we wrap up the Chattanooga location. By chance, two local boys were hired to be in the movie. Both of Sonya Gonzales’ sons, 7-year-old Mason and 5-year-old Liam, were chosen to be in Water For Elephants. “They play two of Robert Pattinson’s kids in the movie,” said Sonya. The most amazing part was that the casting agents didn’t even know the boys were related. Director Lawrence told Sonya that her sons’ scene was an important part of the movie’s ending. For more information about filming in Chattanooga and Tennessee, visit the Chattanooga Southeast Tennessee Film Commission’s website or the Tennessee Film, Entertainment and Music Commission’s website. Another filming location of Water For Elephants was The Alexandria Hotel in East Los Angeles where the speakeasy scenes were shot. Built in 1906 by Los Angeles architect John Parkinson, The Alexandria in its heyday from 1911 to 1922 played host to many heads-of-state and Hollywood legends, from U.S. Presidents William Howard Taft, Theodore Roosevelt, and Woodrow Wilson to Valentino, Sarah Bernhardt, Jack Dempsey, and Charlie Chaplin. It was also the venue where Charlie Chaplin, Mary Pickford, Douglas Fairbanks and D.W. Griffith gathered in 1919 to form their own movie-making company United Artists. Recently the hotel underwent a major renovation and was converted into an apartment building for private residences. Photo of The Alexandria Hotel in Los Angeles, California via Google. The speakeasy scenes in Water For Elephants were filmed in one of the ballrooms at The Alexandria. Marlena’s and Jacob’s escape-to-the-alley scene following the speakeasy was also filmed at the hotel, in an alley nearby. 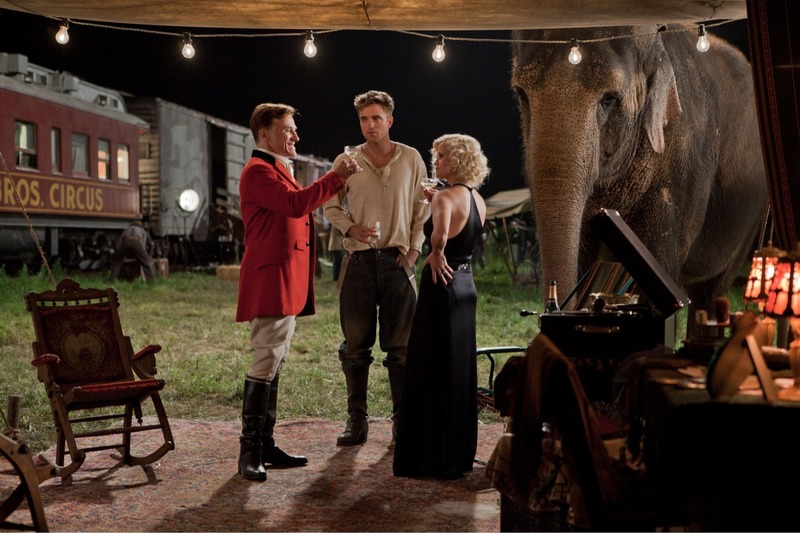 Production still of the speakeasy scene in Water For Elephants via Google. The Alexandria itself has been a Hollywood star for years. Many productions have filmed there, including The X-Files, Se7en, and America’s Most Wanted. The Water For Elephant Fan Site has more photos of The Alexandria Hotel, in case you’re interested on seeing pictures of its interiors. In the book and the movie, Jacob attended Cornell University. In reality, to keep costs within filming budget, UCLA (University of California Los Angeles) stood in for the College of Veterinary Medicine at Cornell University in Ithaca, New York. Filming took place outside of Kerckhoff Hall, a building built in 1931 and fits in perfectly with Water For Elephants which took place during the 1930’s Depression era. Image of Kerckhoff Hall, UCLA via Wikipedia. Due its close proximity to Tinsel Town and beautiful campus ground, UCLA is an old pro in Hollywood. Many movies & TV shows have been filmed on the UCLA campus over the years, including Breathless,The Sure Thing, Final Analysis, Happy Together. TV shows filmed at UCLA include Buffy the Vampire Slayer, Alias, The O.C., and even my personal favorite Gilmore Girls (UCLA stood in for Harvard when ‘Rory’ went there with ‘Lorelai’). UCLA’s film school is legendary because of its famous students and/or graduates. The list reads like a “Who’s Who” in Hollywood: James Dean, Jim Morrison, Jayne Mansfield, Francis Ford Coppola, Carol Burnett, Tim Robbins, Elizabeth McGovern, Heather Locklear, Rob Reiner, Lloyd Bridges, Beau Bridges, Ally Sheedy, and Patrick Stewart (Captain Picard in Star Trek). If you’re in the Los Angeles area and would like to get a glimpse of “Jacob’s school,” sign up for a campus tour which run at 10:30AM and 1:30PM on weekdays, and at 11:00AM and 2:00PM on weekends. The tours begin at the UCLA Visitor’s Center. Call (310) 825-4321 for more details. For information on filming at UCLA, visit the UCLA’s website. After wrapping up filming at UCLA, the production moved to the abandoned Linda Vista Community Hospital in East Los Angeles to film the morgue scene. Linda Vista Hospital, formerly the Santa Fe Railroad Hospital and Santa Fe Coast Lines Hospital, stood in for the Ithaca, New York hospital of the book. The hospital was originally created to treat railroad employees in 1904. In 1991, the hospital was shut down amidst rumors of medical malpractices and law suits. In January 2006, the hospital was added to the National Registry of Historic Places. As an abandoned building, Linda Vista Hospital has been used primarily as a filming location. From these filming experiences, the hospital’s haunted reputation exploded with reports of unexplained phenomena from overnight security guards and production crews. Darting shadows, cries in the night and unexplained humming were all experienced by people working on the hospital grounds. Many even claim to have been touched and pushed by unseen forces. Image of Linda Vista Community Hospital via Wikipedia. As a result of these supernatural sightings and experiences, recently, Linda Vista Hospital has become the subject of paranormal investigations. The most notable one was by The Travel Channel’s Ghost Adventures series. The Travel Channel conducted an investigation on the haunted Linda Vista Hospital. The results are currently on YouTube: Part 1, Part 2, Part 3 and Part 4. Movies filmed at Linda Vista Hospital include Pancho’s Estate 111 (1992), Outbreak (1995), End of Days (1999), and Pearl Harbor (2001). Many television shows were also filmed at the Linda Vista Hospital, among them are ER’s pilot episode, Dexter, and Moonlight (a short-lived vampire series). If you’re into dramatic, spooky places, here’s a set of photos taken from the Linda Vista Hospital/morgue that were down right creepy. There’s also another set of photos of the hospital taken by a photographer named Albert. There are also many comments shared on Yelp.com by folks who have actually visited the hospital. For more information on filming in Los Angeles, contact the California Film Commission. In Part 2 of our article, we’ll get to meet Tai (aka Rosie), the Elephant. We will also hear from a few of the supporting cast members of the movie about their first-hand experiences working on the film sets of Water For Elephants. Check back with us soon! And don’t forget to subscribe to our RSS feed.